I didn’t see a whole lot of new (to me) stuff in Roatan, although I will be sharing a Gaudy Clown Crab that I was super jazzed to see and photograph (and thanks to my eagle-eyed buddies Jamie and Cindy for showing it to me!). I was having a good time playing with the new camera – an Oly OMD Mark II in Nauticam housing, and putting it through its paces. A Nikon DSLR is a bit of a hard act to follow, but the lightweight nature of these very compact micro four thirds cameras (which accept lenses from several makers) made it a very appealing alternative to me. I like this new set up so much that I sold the d300, its underwater lenses and gears, strobes, and housing to a local diver a few weeks ago. I hope he will have fun with it. Anyhoo, back to the camera – I found with the rather spunky viz that we had in CoCo View (due to heavy rain and a lot of wind that blew up later in the week) that I mostly shot a mid or macro lens. When I bought the set up from Backscatter in California, they recommended a 14-42mm as a good mid range lens. With Nauticam’s flip port and a +5 wet diopter (meaning added on to the housing, not the camera), I was able to use this lens for some close work as well. I also bought a 60mm macro lens, which took quite a bit more trial and error to figure out. If I did it again, I would forget the 60mm, which can be frustrating to shoot, and just add a +10 wet diopter to get some super macro out of the 14-42mm. 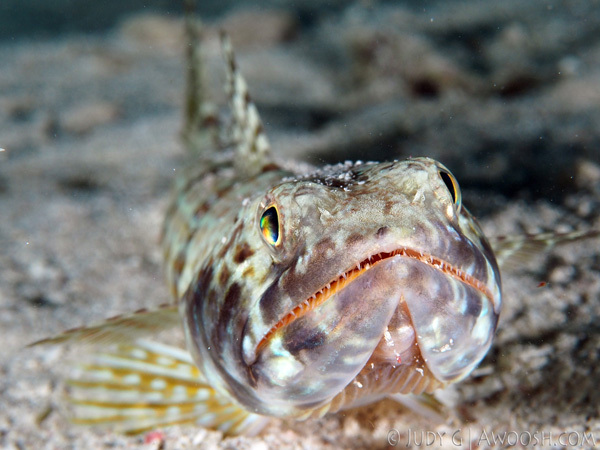 This entry was posted in Photography, Pic of the Day and tagged Lizardfish, Sand Diver. Bookmark the permalink.